What’s new on DVD recently? Well, today I’d like to introduce you two new DVDs including movie 42 and movie The Host. 42 is a 2013 American biographical sports film written and directed by Brian Helgeland about the life of baseball player Jackie Robinson, who wore jersey number 42.And The Host is a 2013 American romantic science fiction film adapted from Stephenie Meyer's novel of the same name. One comes from a real-life example while another is adapted from a novel. Can’t wait to see more detailed information about both films? Now let’s begin our movie journey. 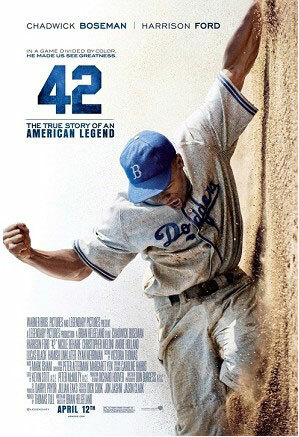 Movie 42 tells the story of two men - the great Jackie Robinson and legendary Brooklyn Dodgers GM Branch Rickey – who bravely stood against prejudice forever changing the world by changing the game of baseball. In 1946, Branch Rickey (Harrison Ford) put himself at the forefront of history when he signed Jackie Robinson (Chadwick Boseman) to the team, breaking Major League Baseball's infamous color barrier. Jackie Robinson then became the first African-American baseball player. However, the deal also put them in the firing line of the public, the press and even other players. Facing unabashed racism from every side, Robinson was forced to demonstrate tremendous courage and restraint by not reacting in kind, knowing that any incident could destroy his and Rickey's hopes. Instead, Number 42 let his talent on the field do the talking-ultimately winning over fans and his teammates, silencing his critics, and paving the way for others to follow. Movie The Host is the next epic love story from the creator of the Twilight Saga’s worldwide bestselling author - Stephenie Meyer. As we all know, the Twilight Saga has gained immense popularity and commercial success around the world. Thus people’s expectations of The Host are high. Let’s have a look at its storyline. In the future, the earth is occupied by a species which threatens mankind by taking over their bodies and erasing their memories. Melanie Stryder (Saoirse Ronan), a human, is captured by the Seeker (Diane Kruger) and infused with a soul called "Wanderer", in order to discover the location of one of the last pockets of non-assimilated humans. However, Melanie survives the procedure and begins to struggle for control of her body. She is one of the last surviving humans who fight back, risking her life for the people she most cares about, proving that love can conquer all in a dangerous new world. As there are always new DVDs, you may need a professional DVD video converter. 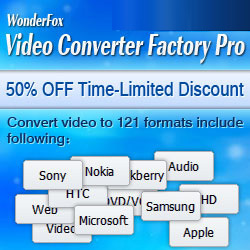 WonderFox DVD Video Converter is what I talk about here. It can help you rip DVD, convert video, edit video or download online video with very fast speed but without sacrificing original quality. Have a free trial to enjoy yourself!